Sweet and tangy, this Gourmet Honey Roasted Peanut Apple is a tasty delight. It’s over one pound of tart Granny Smith apple dipped in caramel, then rolled in crunchy honey roasted peanuts and topped with a decadent drizzle of milk chocolate. It’s crazy-nutty good. Arrives as pictured tied with a bow. This gift is exceptionally fresh and requires overnight delivery. Sweet and tangy, this Gourmet Honey Roasted Peanut Apple is a tasty delight. 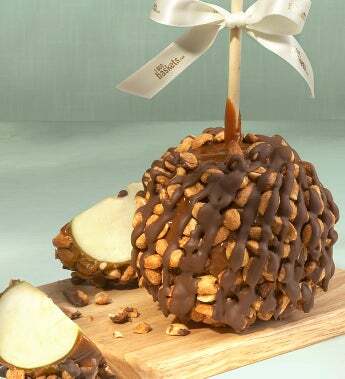 It's over one pound of tart Granny Smith apple dipped in caramel, then rolled in crunchy honey roasted peanuts and topped with a decadent drizzle of milk chocolate.